An international team of astronomers using ground-based telescopes and NASA’s exoplanet-hunting Kepler spacecraft managed to catch a long-awaited glimpse of a Type 1a supernova just minutes after the explosion occurred 170 million light years away. The observations of SN 2018oh (also known as ASASSN-18bt) generally support the long-held idea that Type 1a supernovae are triggered when a compact white dwarf siphons off enough material from a companion star to reach a critical mass, setting off a titanic thermonuclear blast. But SN 2018oh exhibited a faster-than-expected brightening that could indicate a more complex mechanism at work. The research is critical because Type 1a supernovae act as fundamental tools for cosmologists. They seem to explode with the same overall luminosity, allowing them to be used as “standard candles” to measure distances across the universe. Type 1a supernovae were instrumental in helping astronomers measure how the expansion of the cosmos is accelerating due to dark energy. 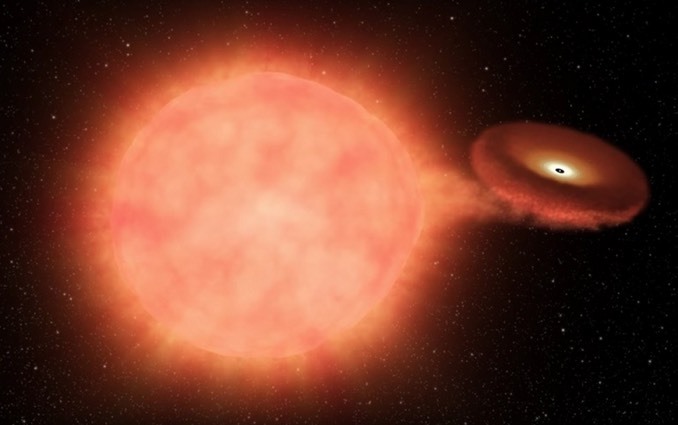 Catching one of these doomed star systems in the act of blowing up has been a long-standing research objective. 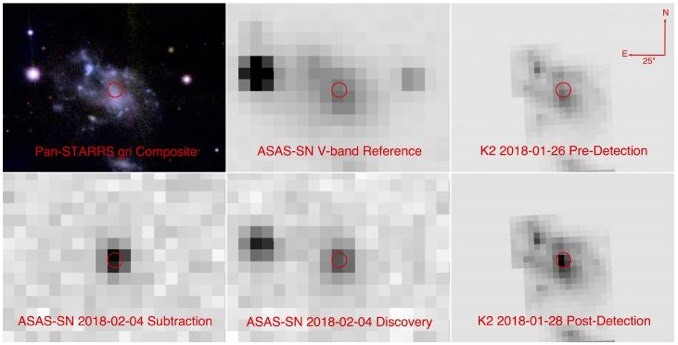 Astronomers finally spotted one in its initial moments on 4 February using the All-Sky Automated Survey for Supernovae (ASAS-SN), a global network of telescopes headquartered at the Ohio State University. The Kepler space telescope collected complementary data using ultra-sensitive detectors designed to ferret out exoplanets. 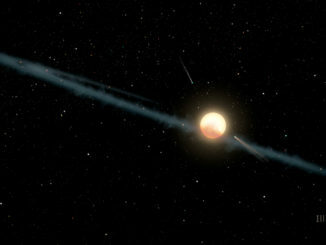 “Kepler, in its final days before running out of fuel and being retired, observed the minute changes in brightness of the star’s explosion from its very beginnings, while the ground-based telescopes detected changes in colour and the atomic make-up of this dying star,” said Brad Tucker, an researcher with the Australian National University’s school of astronomy and astrophysics. A garden-variety Type 1a supernova typically brights over a period of about three weeks before slowly fading away. But SN 2018oh exhibited an unusual brightening a few days after the explosion, ramping up about three times faster than expected. Telescopes in Hawaii and Chile saw the supernova briefly shining with an intensity indicating temperatures of billions of degrees. “It’s possible in the case of SN 2018oh that the shock wave from the exploding white dwarf ran into the companion star, creating an extremely hot and bright halo that accounts for the added brightness and heat we observed,” Tucker said. But maybe not. Analysis by Anthony Piro at the Carnegie Institution raises another possibility. “While the steep increase in ASASSN-18bt’s early brightness could indicate that the explosion collides with another star, our follow-up data don’t fit predictions for how this should look,” said Carnegie’s Tom Holoien. The observations appear to support a hypothesis based on recent work by the Carnegie Supernova Project that suggests there may be two distinct populations of Type 1a supernovae, ones that show this same sort of early brightening and those that do not. 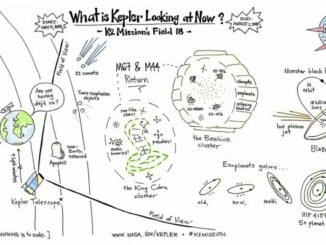 NASA’s Kepler Space Telescope began its 18th observing campaign on 12 May, an 82-day run focusing on star clusters, galaxies and a handful of solar system bodies as the spacecraft nears the end of its life. Among its targets is 99942 Apophis, an asteroid expected to pass close by Earth in 2029. One of the most mysterious stellar objects may be revealing some of its secrets at last. Called KIC 8462852, also known as Boyajian’s Star, or Tabby’s Star, the object has experienced unusual dips in brightness — NASA’s Kepler space telescope even observed dimming of up to 20 percent over a matter of days. In addition, the star has had much subtler but longer-term enigmatic dimming trends, with one continuing today. 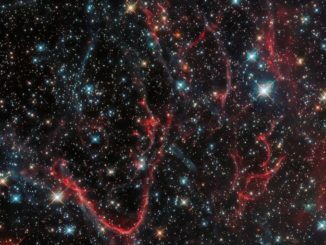 Tangled clouds of gas from a destroyed star can be seen weaving their way through space in the Large Magellanic Cloud, the remnants of a Type 1a supernova that consumed a white dwarf in a once glorious blaze of light. Such supernovae are critical to measuring cosmic distances.